If us globetrotters had a crystal ball, one of the top questions we would ask is: what is that magic date to snag the lowest flight price? Of course, there are many unpredictable factors cause flight prices to fluctuate, so we can never truly know when the lowest price will become available. But existing flight price data and patterns can give some indication of when that sweet spot is likely to be found. CheapAir.com’s team of analysts has mined through data to produce its Annual Airfair Study, looking at 917 million airfares in more than 8,000 markets to offer the most educated recommendations on when to buy your airline ticket. Here are some of CheapAir’s key findings. For 2018, the “best day to buy a flight” on average within the continental USA (which can be transferred to other countries) was… drumroll please… 76 days out from your travel date. The average best day to book is a very simplified number and doesn’t account for the varying factors that play into your booking experience. CheapAir’s analysts have identified different “booking zones” based on the type of traveller you are, to help you really figure out what is best for you. First Dibs is for buyers with an agenda. You know who you are. You’re less motivated by price and more motivated by your flight preferences (such as a certain flight time or seat) and you want to lock in plans well in advance. Flights in the First Dibs zone do cost about $50 more per ticket than flights in the Prime Booking Window (the most affordable zone), on average. If you like to have many options, however, there’s no better time to buy. This is where the magic happens, travellers. And while some of the other zones have shifted slightly from one year to the next, the Prime Booking Window stays pretty solid. What does this mean? Well, the data shows that the lowest airfares tend to pop up about four months to three weeks in advance of your travel dates. Fares in this zone are within five percent of their lowest point. Bargain shopping? Stay in the sweet spot – the Prime Booking Window. We’re heading into gambling territory once you get within two to three weeks of your travel dates. The odds of getting a “cheap ticket” start to decrease heading into the Push Your Luck zone, though if you do like to roll the dice you may still find cheap tickets. 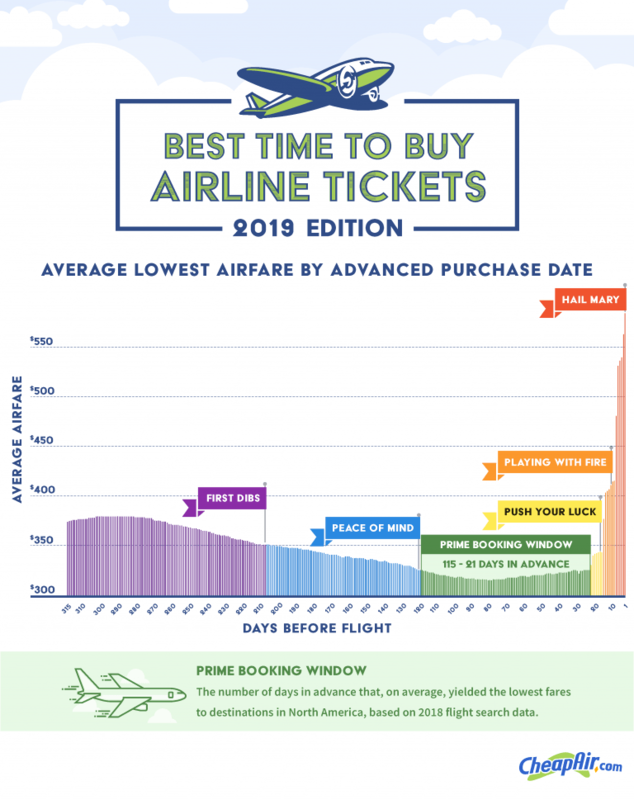 One important factor to consider – though there could be lower priced fares in Push Your Luck, the quantity and quality of seats is more limited the closer we get to the travel date. You may find yourself paying slightly more for a subpar seat. No matter how long we’re in the airfare prediction game, we find that some people just like to play with fire. Hence, they carved out the Playing with Fire zone. You’ll almost always pay more than Prime Booking Window buyers, but pay less (close to $135, on average) than people who wait until the very last minute to buy. In this zone, choice is even more limited. 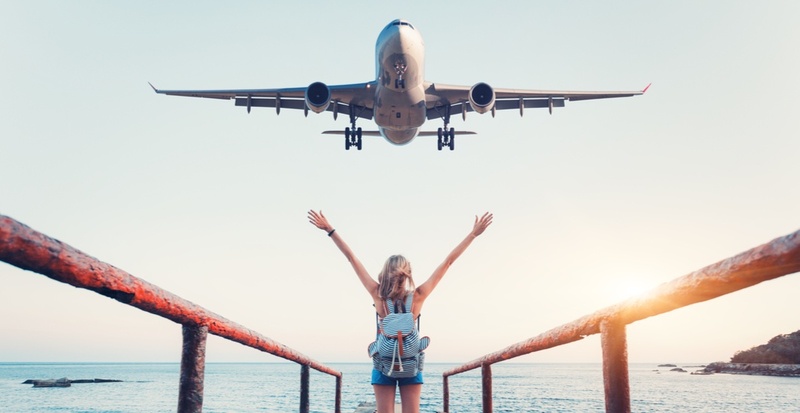 Contrary to popular belief, whether you book your flight on a Tuesday or a Sunday does not make a significant impact on the price; the average low fair only varies by $1 based on purchase day. However, there are definitely price differences on the day of the week on which you fly. Tuesday is said to be the cheapest, at nearly $85 cheaper than the most expensive day, which is Sunday. In general, weekends tend to be more expensive days to fly. 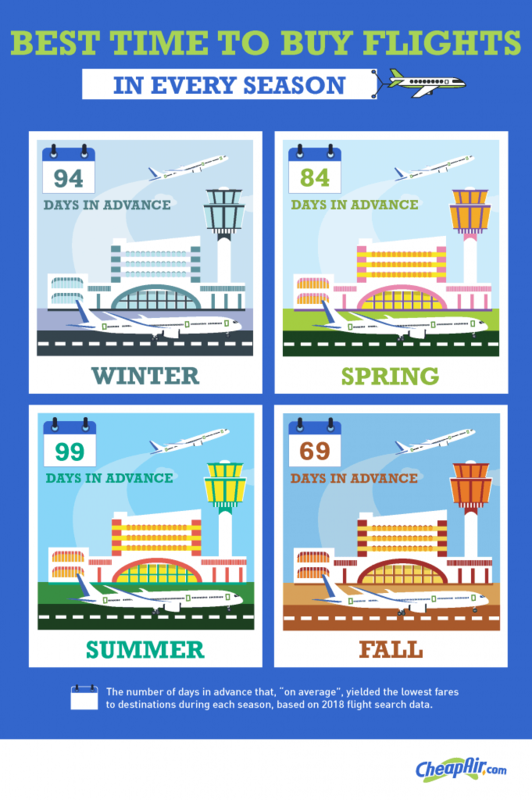 CheapAir’s study reveals the best time to buy flights based on the season. Tip: Steer clear of Christmas and ski destinations. Winter is the most expensive time to travel. Of course, the findings in this report are not foolproof, and flight prices will always fluctuate. It’s always best to compare prices on different booking engines such as Google Flights, Skyscanner, and Kayak, and keep your eye out for deals right here on your local Daily Hive city. If you see a price that seems decent and the destination is calling your name, then YOLO and hit book! Now that you know when to book, it’s onto the fun part — where to go!? Here’s some inspiration to guide you in the direction of your next adventure.